There is something incredibly special about the Fall season. It is crisp, cool and a huge reprieve from the long, sweltering days of summer. A time when green starts to turn red and brown and the scenery create an idyllic canvas for just about anything. The weather becomes chilly, but is nice enough to enjoy being outdoors. There is something equally special about celebrating true love with a picturesque Fall wedding. Though we may not fully experience the quintessential Falls of say, New England; here in Bakersfield, we can still embrace the changing weather with beautiful outdoor themed festivities. Weddings (and events) have an opportunity to play on the drama of this time of year with great colors in deep shades of red, brown and orange. Think purple, burgundy and emerald green, too. These types of colors make for visual representations of the cool Autumn season. As for attire, you may want to choose a heavier fabric for your bridesmaid’s dresses or have your party wear boleros or pashminas to keep the chill at bay. Or at least keep shawls on standby. Here in Bakersfield, the weather can bounce around a bit and it seems to trick us sometimes. Luckily, your Fairy Godmother will ensure you are prepared for any and everything! Deep jewel tones, festive metallic and long-sleeved bridesmaid dresses are all valid options for your best girls’ autumn attire. The groomsmen will have a much easier time staying warm under cooler conditions. But, we can still get creative with their fall wardrobe, too! Consider stylish argyle socks, plaid or flannel ties even. Navy suits are a fantastic, bold and stylish choice for the men, if it works with your color pallet. 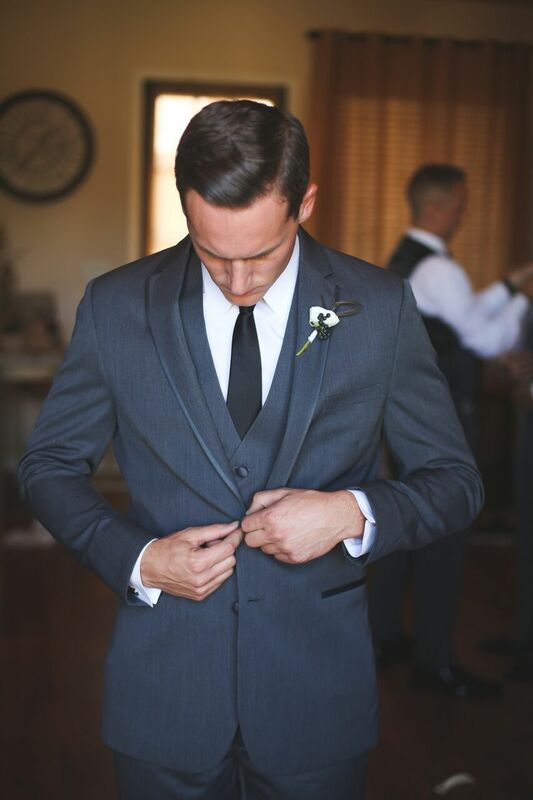 Traditional black or gray suits are always a timeless and sophisticated choice, as well. We can help you find the right vendors for your big day. If you want to embrace all things Fall, we will all work together to incorporate as much (or as little) of the season’s offerings as we can. Book your caterer early and ask to feature fresh, in-season foods. Warm, spiced soups would be perfect to start. You could even host a hot chocolate bar with all the fixings, or dish up cozy mugs of apple cider. There will be also be so many options for your wedding décor and floral arrangements. Tell your florist and your designer the vibe you are going for and they will know exactly what to do! With the right colors, food and tablescape design, your guests will be able to see, feel and taste all that is so beautiful about Fall. Another bonus for having a Fall wedding is inevitably beautiful photos! This time of year has got to be a favorite for wedding photographers. Full of deeply saturated hues, Fall provides an effortless backdrop for all your precious photographs. The sun is low and you can almost feel the crisp weather through the pictures. There are so many reasons to have your wedding during this wonderful time of year! We would love to talk with you about your upcoming wedding! We would be honored to be a part of your special day. Call us and we will set up a free consultation. We can’t wait to meet you!